Editor/Author Scott, Peter and Cavanaugh, William T.
Written by a team of international experts, drawn from various traditions of political theology, this outstanding resource brings together newly-commissioned essays in the field. Demonstrates that Christian theology is inherently political and shows how theology impacts on present-day political issues. Considers the interface of theology with political ideologies, including the contribution of theology to feminist, ecological, black and pacifist movements. 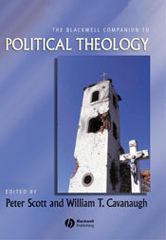 Assesses the contribution of the major political theologians and theological movements. Explores the political aspects of Christian sources such as scripture and liturgy.